When pet prosthetics are done right, they give an excellent quality of life for a Tripawd. When done badly, they are ineffective at best, harmful at worst. In today’s first of a special two-part Tripawd Tuesday story, you’ll learn how one dog got evaluated and treated for a partial amputation and prosthetic leg by the people who do them right, the experts at the Colorado State University Veterinary Teaching Hospital. We know you’ll learn as much from Bridget’s story as we did. A big thanks to her mom Kathleen for taking time to educate us. Enjoy! Bridget is a rescued Lab/border collie/other mix we got almost eleven years ago from a local Lab rescue organization when she was age 5 months old. She’s very sweet, smart, loves people (especially little kids), most other dogs, cats, is obedient and doesn’t wander as a lot of Labs like to do. She’s also a good watchdog, alerting us when packages have been delivered (so we can beat the porch pirates to them), if she sees someone or something unfamiliar in or around our home, or hears a noise that’s unknown to her. True to the border collie part of her heritage, she’s very active and likes to have jobs like fetching the newspaper from the driveway. She is truly the best pet we have ever had! When she developed a painful lump on her left front paw, I didn’t waste time getting her seen by our veterinarian. Draining the fluid capsule and testing it didn’t reveal any abnormality so we hoped the lump would resolve with time and a variety of treatments. Finally, as the lump grew larger and more painful, a punch biopsy was done, and the diagnosis was synovial myxoma. We visited a specialty surgeon veterinarian to see if the growth could be removed without amputation, but a CT scan revealed the growth was too involved with her foot to excise it. We also had a consult with an oncology veterinarian; both veterinarian specialists referred us to Colorado State University Veterinary Teaching Hospital (CSUVTH) to consider the option of partial amputation. In some situations, full amputation is the only alternative or the amount of residual limb possible after partial amputation would not be enough to fit a pet prothesis, so a decision is straightforward. I was concerned about the amount of pain she was in and wanted to give her some relief. Because synovial myxoma doesn’t typically spread to other parts of the body, the options were partial or full amputation of her leg to relieve the pain. Her overall health was very good, and before the tumor she loved to go on long, long hikes or walks so she was very strong and fit (and didn’t act her age!). She is also a very happy dog who really enjoys life. Although she was active, I was concerned about full amputation when it wasn’t necessary and the stress it would put on her other legs at her age (10) which already had a touch of arthritis. I literally agonized for months, all the while giving her medications for the pain, until I could make peace with the right decision for her. Bridget’s health and fitness, her zest for life, the type of tumor she had, and the location of the growth made partial amputation a reasonable choice. Our local veterinarian had no experience with partial amputations and I wasn’t aware of any veterinarians locally who performed partials. I emailed a request for a consult and was contacted by Dr. Theresa Wendland who coordinates a study focusing on partial amputation with prosthetics. She emailed me, answering my questions and we also talked briefly on the phone. 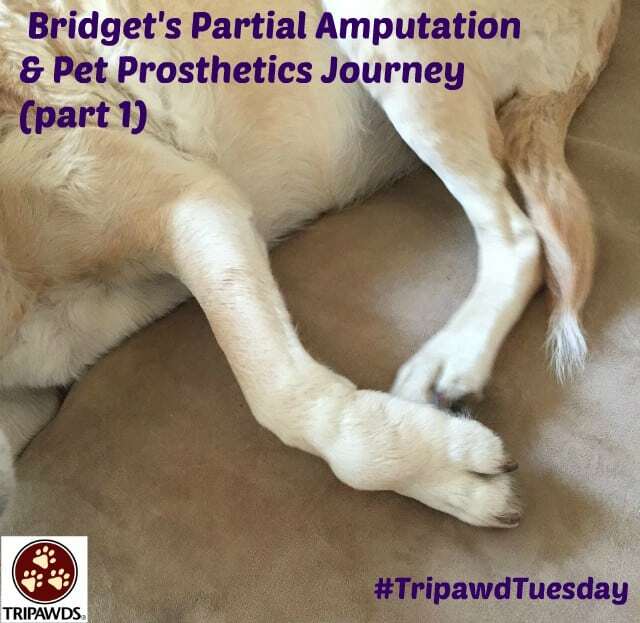 She encouraged us to bring Bridget to CSUVTH for a consultation and introduced us to the Tripawds website where I began to educate myself about, and prepare myself for, the issues surrounding amputation. Distance prevented us from participating in her pet prosthetics study–we are an 8-9 hour drive from Fort Collins, Colorado–so the frequent follow up visits the study protocol required unfortunately would not be possible. We planned that ongoing care was going to be handled by our local veterinarian in conjunction with a local pet rehabilitation center. how to adapt our home for her to get out for potty breaks to avoid snowy and icy stairs from our deck to the yard (her surgery happened just as we were starting to get winter weather). Although we didn’t have pet insurance, we were able to cover the projected expenses and because she was so dear to me, I wanted to give her the best chance for a relatively normal life, however long or short it might be. I understand that some dogs travel to CSUVTH by plane with or without their pet parents but I wanted to be there with her as she traveled so we drove to Fort Collins. There are pet friendly hotels in Fort Collins so we were able to get a room fairly close to CSUVTH that allowed us to keep Bridget in our room. 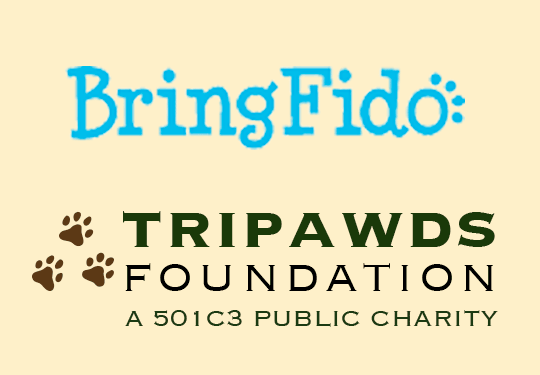 BringFido bookings help Tripawds Foundation! Some hotels even offer a discount to clients of CSUVTH—you have to ask. CSUVTH is very thorough in evaluating their patients to rule out underlying conditions that might impact their healing and recovery. Because we had recently had a regular well check, lab tests, a CT scan and other evaluations (oncologist, veterinary surgeon), these did not need to be repeated at CSUVTH. 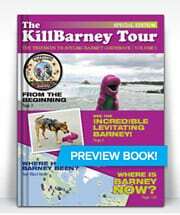 This information was forwarded to CSUVTH before our visit. On our consult day, we met with one of the surgeons, and then Dr. Wendland had also arranged to meet with us. Bridget was thoroughly examined, and her case discussed with the CSUVTH team. At that point everyone agreed that Bridget’s type of cancer and her overall health and condition made partial amputation and prosthetic a good option, so her surgery was arranged for two days later. I had explained in advance that I wanted her to receive surgery if the consult confirmed partial amputation was possible, so we would not need to make an additional trip. The staff were great to answer all my questions and were understanding about my tender feelings in making this decision. We brought Bridget for surgery in the morning and were to pick her up the following morning (if everything went to plan, which it did). All the staff were great, so I felt I was leaving her in good hands, but it still was hard emotionally. We were given very detailed post-operative care and medication instructions from the surgeon and it was helpful that the multiple medications had dosage and time of next dose clearly outlined. We were facing an 8 to 9-hour drive home and wanted to make sure she would be comfortable. Being reunited with Bridget was great but it really was hard to see her attempting to use her bandaged partially-amputated limb. 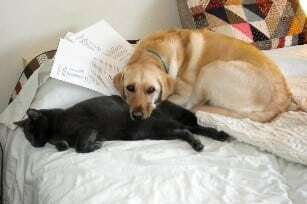 She had been given significant pain medication and so hopefully she wasn’t feeling much pain. She had on a new Help ‘Em Up harness on her torso and an auxiliary harness on her hind quarters that gave us the ability to pick all 65 pounds of her, if necessary, by holding the two handles on the harness. The harness also allowed me to lift her bandaged limb up slightly as we walked to the car so she wouldn’t have to put a lot of weight on it. We had a folding dog ramp for our SUV that she was already accustomed to using so loading her was easy. She was so eager the get in the car, she wouldn’t pee before we left so at our first stop we gave her a chance to go but she was anxious about trying to go down the ramp, even with help. Because it was a long drive we stopped several times and, when she finally was desperate enough, she allowed me to help her down and up the ramp and we were able to make it home where she was grateful to settle in. I was grateful that I had thought about how Bridget would get out for potty breaks because we have a deck and stairs that lead to the back yard and winter was upon us. My husband was sweet enough to build a long sloping ramp from the deck to the yard, with textured deck paint for traction in the icy/snowy weather. So, neither of us had to worry about navigating icy or snowy stairs and the risk of falling. It was hard to watch her trying to potty with 3-2/3 legs but I quickly learned that she didn’t want me standing near so I had to “let go” and let her figure it out, which she did fairly quickly. I was careful to make sure she got her medications at intervals exactly as directed but in the middle of the first night she was very restless and kept getting up and circling and circling on her bed, trying to get comfortable. Subsequent nights were better, but it took a few days before she was sleeping peacefully. It may have been just the “feeling weird” from the drugs that made her restless and not pain.